I worked this up for the CC124 Pink Olives challenge on Splitcoast Stampers. It's too much pink, though -- is that possible? apparently so -- and I can't get happy with it. I really wanted to put in some Chocolate Chip, but that wouldn't work with the challenge. 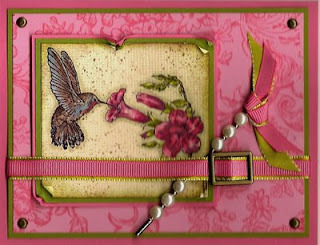 The large Pretty in Pink layer was stamped with Bella Toile in Regal Rose craft ink. The central image was overstamped with Canvas in Sahara Sand and the spatter out of Itty Bitty Backgrounds in Creamy Caramel and Close to Cocoa.